Your gifts are critical to our success. Why? We are always in need of volunteers, teachers, classroom supplies, scholarship funding and donations to help the organization grow. 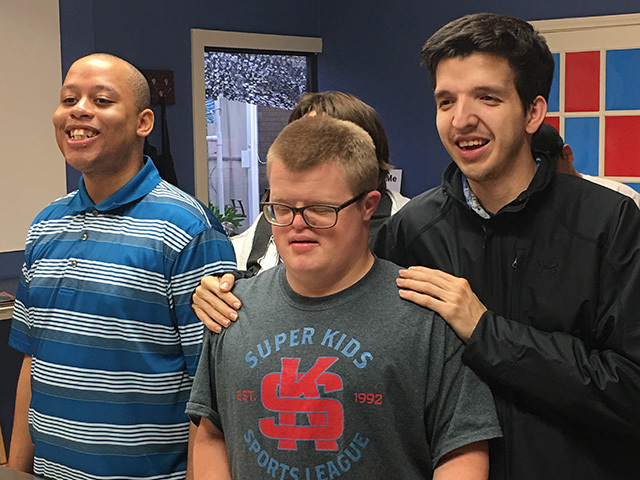 Our mission to help adults with disabilities stay as fully functional as long as possible is an enormous challenge. Our students are not working toward graduation as one might in college, but to practice current skills regularly and toward new ones. We hope they will still be with us throughout their lifetime. Subsequently, they and their families must use personal funds frugally. Families/parents may not be saving for their own retirement but rather that of their adult child’s retirement. To meet our students’ goals of life-long functionality we must use the best programs and curricula that is available and have exceptional teachers. This programming is not inexpensive. Not only is it challenging to meet these costs, we have still another challenge: to provide scholarships for students who have no resources. We help families access any public funding available and then ask families to pay any uncovered expenses. Our programs cost far more per hour than we charge due to the generosity of the community. However we are always in need as we grow and develop. We are blessed to have donations of materials, volunteers for the office, teaching and field trip driving, but we are constantly watching our budget closely each month. We thank you for considering help us reach our lofty goal. Come Read with Me is a 501(c)(3) Nonprofit Organization. Your donations are tax-deductible.